I've been obsessed with Old Gold lately. I've been wearing it for nearly a week straight, I only broke my streak on Sunday when I wore that BE Foiled Eye kit again. I've been doing a variation on the same look, trying to get the most duochrome/iridescent effect as possible out of my shadows. I only got two looks to sort of turn out in pictures. I think I'm pretty good at taking pictures of my own hands now, but I haven't quite gotten the hang of eyeball pictures yet. I guess I need more practice. I can't seem to get the lighting right to catch the colors. Flash and blurry, the shimmer and sparkle really shows up this way! So weird, the blurrier the picture, the better the glitter looks! This makes me think 'dryad'. both are really pretty, nice blending too! You are so great with eye makeup, too! I love both of them, and I think they work really well with your eye colour and skin tone. Gorgeous! I think your eyeball shots are fine, and I love when you post makeup looks! I rarely ever stray from my same old same old colors, but I love looking at pretty new combos! Very pretty! I don't do makeup anymore. I had one bad face and I just gave up on everything other than mascara afterward. But, definitely pretty. I am jealous that I do not have these skills! I'm a HUGE Duochrome fan. LOVE LOVE LOVE them. I have a lot from Fyrinnae. You should check out Glitterboi and the other Arcane Magics from Fyrinnae. Meow has some fantastic duochromes, but they're in the Friday the 13th collection, which is only available on Friday the 13th and at Halloween. Beauty from the Earth has some lovely duochromes, too. Awesome! Thanks for sharing these. The liner is fierce in the first one. You make me want to pull out Old Gold and have a play at it. My favorites are Jashoda, June Bug, and Naked. The pictures aren't good indicators. Jashoda is a reddish brown with green, brown duochrome. 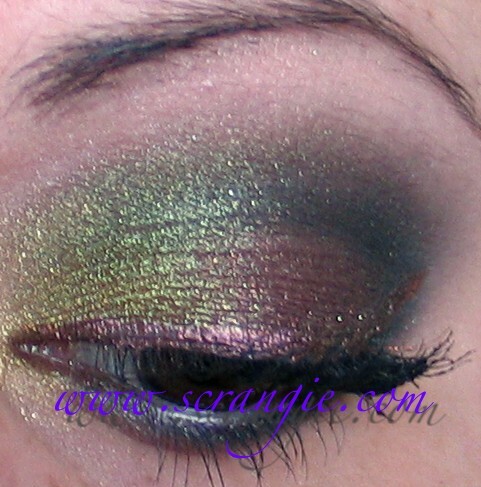 June Bug is a brown with green duochrome. Naked, not sure if she still makes it, is a peachy pink with blue duochrome. It might be called In the Buff now. I haven't bought anything from her in a while, but I love using Naked during the summer. Yay, makeup looks! Very nice. Wow! I would never have thought of that combination. And your eye pics look fantastic! I would love some tips, actually. How do you manage to get such a clear picture of your own eye? What kind of camera do you use? And how do you use it? I think both looks are gorgeous! very very very nice!! nice blending and matching of colours!! 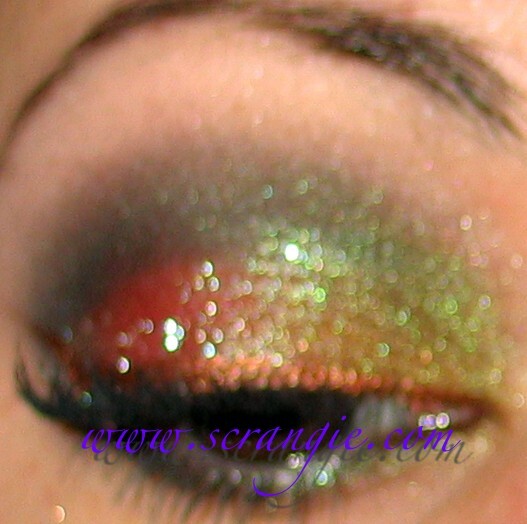 i should play around with my pigments soon!!! An awesome shadow that changes colour depending on the light is Too Faced's single Label Whore. Really amazing. OMG Scrangie has an eye, she's more than a pair of amazing nails. My favourite duochrome eyeshadows come from Fyrinnae, I believe they call them Arcane Magic and I often wear Archmage and Dragonmagic. I love your application of these shadows. 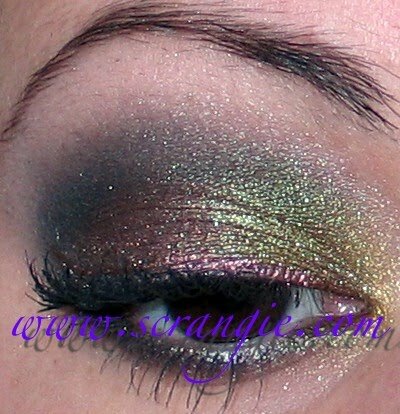 My favorite duochrome of the moment is from Bella Sugar Cosmetics. The color is called Chocolate Covered Blueberry. The base is brown and there is iridescent shimmer in blue-green that shifts back in forth in the light. I know what you mean about becoming obsessed with a shadow and trying many variations. I love my MAC Old Gold! 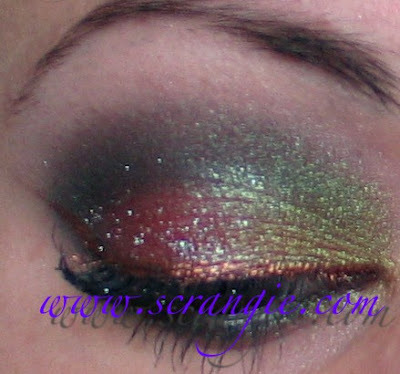 Try MAC's motif and stars 'n rockets eyeshadow. Pink bronze & Violet pigments are my favorites. Blimey I had nail envy from your blog now I have all round cosmetic application ability envy - and thats not easy to say! Your eyes look fantastic, I wish I could do something like that on me! beautiful. I would love if you would share your secrets for such perfect makeup! how do you keep the colors so bold? and how do you blend without mixing the colors into one big mess? total mystery to me. Scrange - one word - HAWT!!! this looks gorgeous. You probably already have this but MUFE Star Powder 90955? I think it is the same sort of colour as MAC brown/green (which I can't remember the name of) and Intrepid L'oreal HIP. This look is beyond stunning!!! Very pretty, but where would I wear a look like this? An evening out? Or to a nightclub? Lounge by Urban Decay is the only duochrome I feel like looks halfway decent on me. Your eyes totally pull it off! Loose Ends and fun stuff.